25 WINTER 2019 first attempt, rather than a perhaps improved-upon later version. A monk in the audience provided the simplest reason: prayer. "It was chosen as a gift for Rome because it was the oldest," Chazelle says. 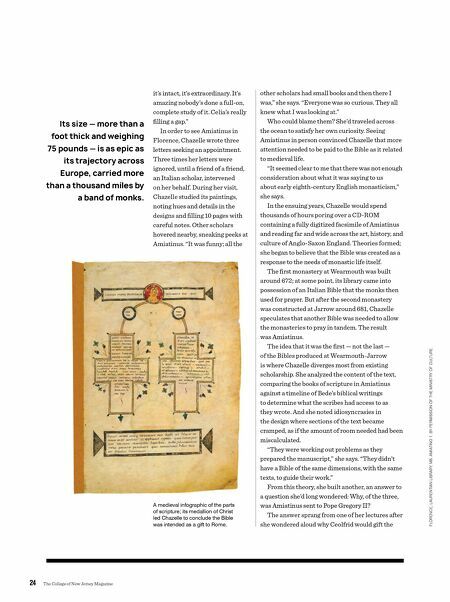 "It was the most sacred since it absorbed the Holy Spirit through use in prayer." After so many years, many pieces of the puzzle have finally come together for Chazelle. In October, the Codex Amiatinus returned to Britain for the first time since monks carried it out more than 1,300 years ago. It is part of the British Library's ambitious Anglo-Saxon Kingdoms exhibition, which includes the Domesday Book, which is William the Con- queror's 1086 land survey of En- gland, and the St. Cuthbert Gospel, Europe's earliest intact book. 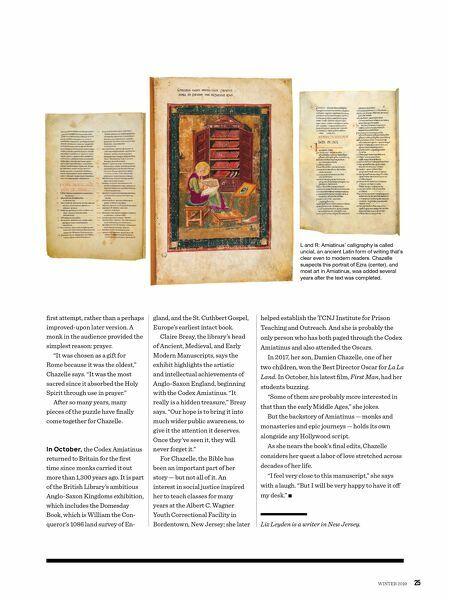 Claire Breay, the library's head of Ancient, Medieval, and Early Modern Manuscripts, says the exhibit highlights the artistic and intellectual achievements of Anglo-Saxon England, beginning with the Codex Amiatinus. "It really is a hidden treasure," Breay says. "Our hope is to bring it into much wider public awareness, to give it the attention it deserves. Once they've seen it, they will never forget it." For Chazelle, the Bible has been an important part of her story — but not all of it. An interest in social justice inspired her to teach classes for many years at the Albert C. Wagner Youth Correctional Facility in Bordentown, New Jersey; she later helped establish the TCNJ Institute for Prison Teaching and Outreach. And she is probably the only person who has both paged through the Codex Amiatinus and also attended the Oscars. In 2017, her son, Damien Chazelle, one of her two children, won the Best Director Oscar for La La Land. In October, his latest film, First Man, had her students buzzing. "Some of them are probably more interested in that than the early Middle Ages," she jokes. But the backstory of Amiatinus — monks and monasteries and epic journeys — holds its own alongside any Hollywood script. As she nears the book's final edits, Chazelle considers her quest a labor of love stretched across decades of her life. "I feel very close to this manuscript," she says with a laugh. "But I will be very happy to have it off my desk." ■ Liz Leyden is a writer in New Jersey. L and R: Amiatinus' calligraphy is called uncial, an ancient Latin form of writing that's clear even to modern readers. Chazelle suspects this portrait of Ezra (center), and most art in Amiatinus, was added several years after the text was completed.